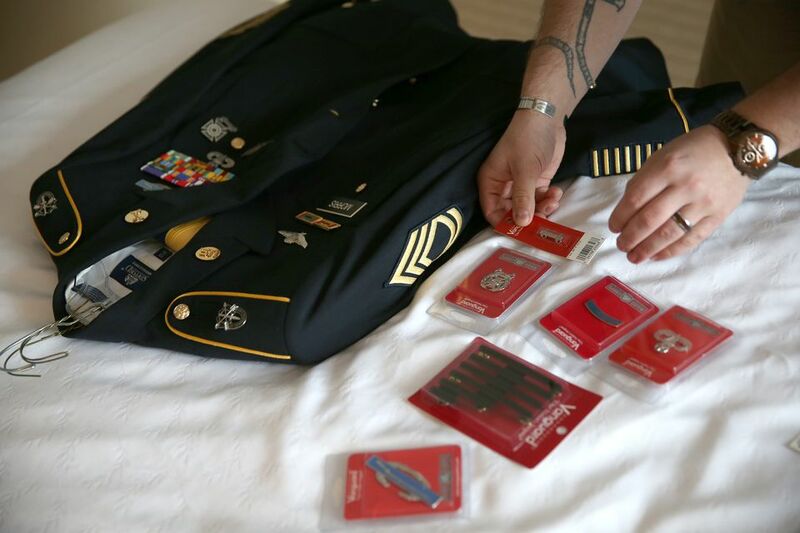 Military uniforms and medals of our servicemen and women deserve respect and preserving them for future generations can be done with just a bit of care. The key to preserving fabric is to protect it from the elements, especially light and moisture. With proper handling, the uniforms and medals should last for generations. The first step is to be sure that the uniform and support pieces are as clean as possible. The uniform should be professionally dry cleaned or washed as appropriate. Be sure every piece is completely dry before storing. Moisture can cause mildew and deterioration of fabric. All metal and leather elements should be thoroughly cleaned and dried completely to their best state before you begin. As much as possible, military uniforms should be stored flat in an appropriately-sized container. Garments that are left hanging can become misshapen from the stress on seams. You should use storage boxes sold for archival storage. These are made of acid-free paper and are perfectly safe to use. Buy the largest size you can because the fewer folds in the uniform, the longer it will last. However, if you cannot find the storage boxes or if you are concerned about the box getting crushed, purchase a plastic storage box. The box must be made of cast polypropylene to be safe for your fabric keepsakes. Look for the #5 within the recycling triangle or the letters "PP" to be sure that you have the correct type of box. Other types of plastic can cause yellowing. Never store a uniform in the plastic bag furnished by a dry cleaner. You will also need to purchase archival tissue paper. It must be both acid and lignin – a chemical compound derived from wood – free. You will need the tissue to soften folds, wrap individual pieces and stuff hats so they will not be crushed. Before you begin, wash and dry your hands – no lotion or creams should be used that can stain clothing. For best results, use cotton gloves. Begin by lightly stuffing hats and uniform coat shoulders with the acid-free tissue paper to help them hold their shape. Then, lay the garment onto a layer of tissue. Place a layer of tissue between each garment within the box. Wrap each small item with tissue. Be sure that there is tissue cushioning each fold. This will prevent heavy creasing. Finally, place the item in the storage box. Repeat steps with each individual item. Do not overstuff the storage box. You may want to store heavier items in smaller individual boxes. Any metal items should be removed from garments and stored separately. The metal could rust or corrode and cause staining to fabrics. Wool fabric contains sulfur which actually attacks the metal. Service medals should be cleaned with a dry, soft brush. Never wrap together with rubber bands which can react with the metal and cause stains that are impossible to remove. It is especially important to handle the medals with care. The acid in human perspiration can cause oxidation of the metal. Each medal should be wrapped separately in the acid-free tissue or stored in its original presentation case. Choose a dark, cool, dry space for storage. Avoid extreme temperatures areas like attics, basements, and garages. The ideal spot is an interior space away from exterior walls and pipes that might burst and off the floor away from pets. Inspect the military treasures at least once per year. Look for any stains that may appear and treat them promptly. You'll have better success the sooner the stains are caught. With clean hands, fold items slightly differently with the tissue to minimize creases and stress to the fabric. Are You Using the Right Iron Settings?